FILE: Site of the 23-acre campus presently occupied by Horizon Christian Academy at 2000 N. Wells St. The proposed sale of the former YWCA campus on Wells Street to Wallen Baptist Church is getting pushback from neighborhood leaders. They fear the types of programs the church might bring to the area, while altruistic, could provide an opportunity for vagrants and perhaps drug dealers to gain a foothold, just as the Wells Street Corridor has made a comeback. The church, 1001 W. Wallen Road, and Hope Community Church, which Wallen Baptist operates at 1213 St. Marys Ave., would consolidate and occupy the 23-acre campus under a common name, Tim Williams, church administrator, said last week. If the sale goes through, the church plans to partner with other ministries to occupy the six buildings on campus. What those ministries might offer is unclear. Williams said Tuesday the church will work with the neighborhood to focus on services that are needed. He said it has no ministries targeting the homeless or drugs but is dedicated to anyone seeking help. “As an evangelical church, we are kind of in the business of helping people who have needs,” he said. Residents say Wallen Baptist has not been specific about its plans. People from the neighborhood met with the church about a month ago and came away concerned about some people the church might serve, said Bud Mendenhall, president of the Bloomingdale Neighborhood. The area has pushed to address drugs and panhandling and doesn't want a resurgence, he added. John Modezjewski, with an organization called Neighborhoods United Group, said he's not against the church and has a soft spot for the homeless, but “everything affects our neighborhoods, and sometimes we feel forgotten.” What happens when the church's programs end for the day? he asks. Wallen's lack of candor about its plans is what's “breeding the mistrust,” he said. Asked what should locate on campus, Modezjewski said he would like to see a college or a church as long as the neighborhoods coalesce around it as they did in creating Franklin Park, where Franklin Elementary School once stood at 1903 St. Marys Ave.
Judi Wire, vice president of the Wells Corridor Business Association, said another meeting with the church is set for December. The neighborhoods are glad someone is looking at the property “to stabilize those buildings,” she said, but it will be a large expense and residents want assurances the church knows what it's getting into. Wire would like to see an arts-focused campus, perhaps a cinematography school that could tie in with nearby Punch Films in Fort Wayne. Senior housing also might work, she said. Williams, of Wallen Baptist, said churches, by their nature, attract all kinds of needs and provide help to those seeking it. Parishioners have not voted on the sale, but if it is finalized, community sports camps and recreation for seniors such as pickle ball are also envisioned, he said. City Councilman Geoff Paddock, D-5th, who represents neighborhoods surrounding the campus, said more neighborhood meetings about plans for the property would be a good idea. Neighbors are wanting more information, he said, and meetings could provide a forum for what they envision for the campus. 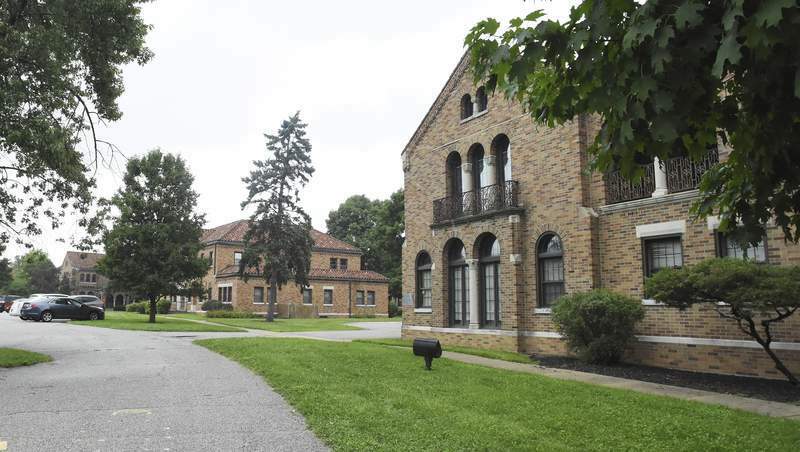 “From my perspective, personally, I'd be pleased to see a once-vibrant campus come back to life with these beautiful buildings that we would hope would be preserved and a church with several hundred parishioners would certainly be a welcome addition,” he said.